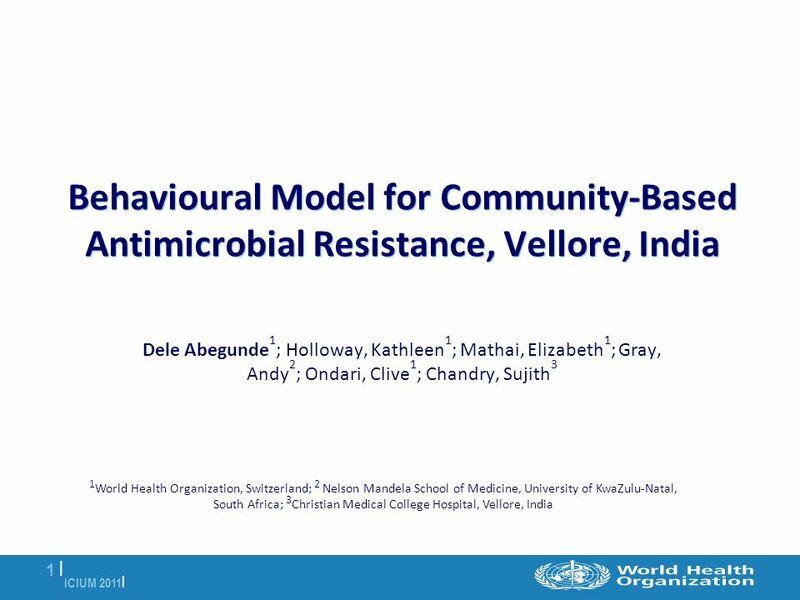 ICIUM 2011 | 1 |1 | Behavioural Model for Community-Based Antimicrobial Resistance, Vellore, India Dele Abegunde 1 ; Holloway, Kathleen 1 ; Mathai, Elizabeth. 2 ICIUM 2011 | 2 |2 | Background Resistance to antimicrobial agents compounds the burden of diseases worldwide. 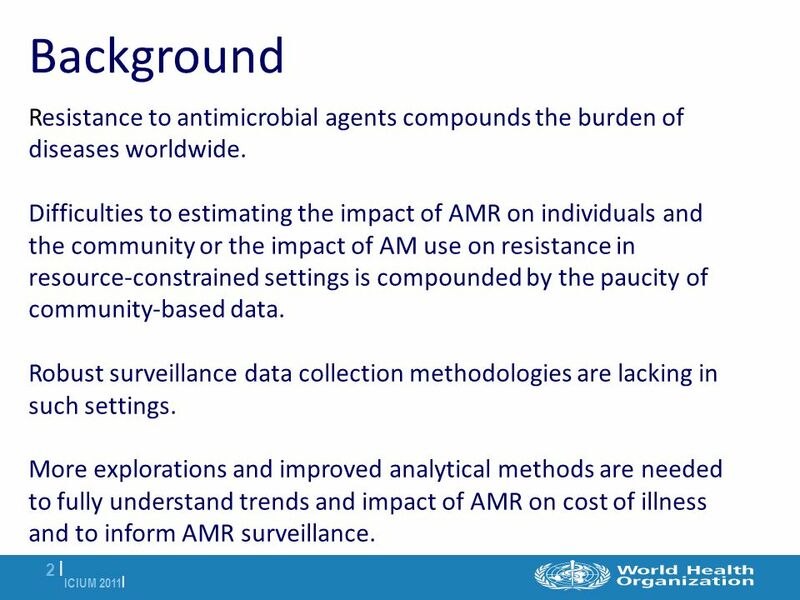 Difficulties to estimating the impact of AMR on individuals and the community or the impact of AM use on resistance in resource-constrained settings is compounded by the paucity of community-based data. Robust surveillance data collection methodologies are lacking in such settings. 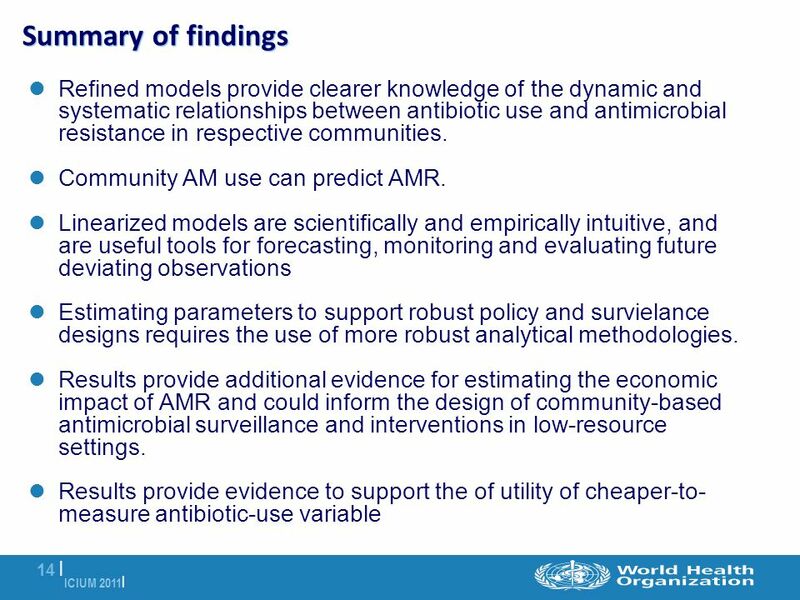 More explorations and improved analytical methods are needed to fully understand trends and impact of AMR on cost of illness and to inform AMR surveillance. 5 ICIUM 2011 | 5 |5 | Methods Data AMR surveillance data from Vellore (urban area) and KV Kuppam, situated between Chennai and Bangalore combined population of 500, 000 in a 3.5million Vellore district in the state of Tamil Nadu, Southern India. 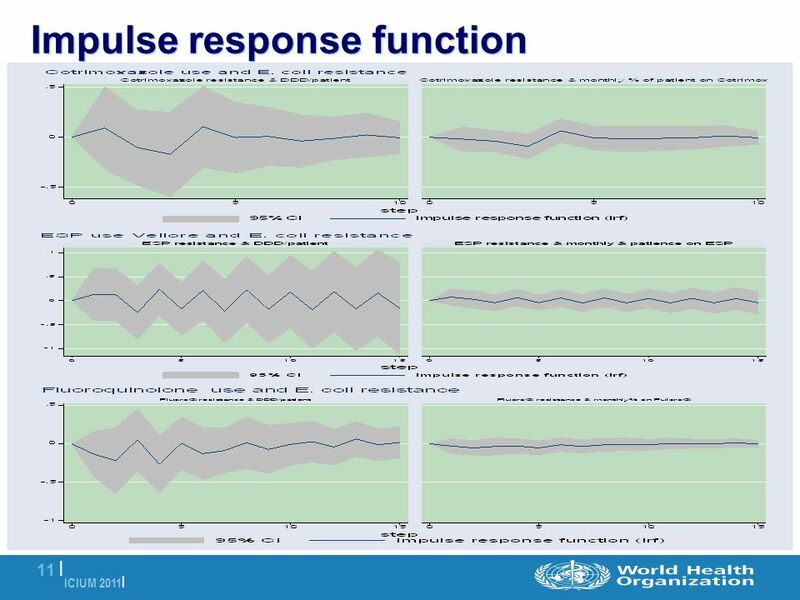 AMR surveillance data consist of commensal E. coli isolated from urine/perinea (swab) samples obtained from asymptomatic pregnant women attending antenatal clinics. Monthly AM-use data were those obtained from exit interviews conducted by pharmacists from urban and rural facilities: – hospitals or primary care clinics (including not-for-profit and for-profit hospitals in the rural and urban areas); – private sector pharmacies; and – private sector general medical practitioners’ practices. All data were collected in two-time period, from August 2003 to July 2004 and from January to December 2005. 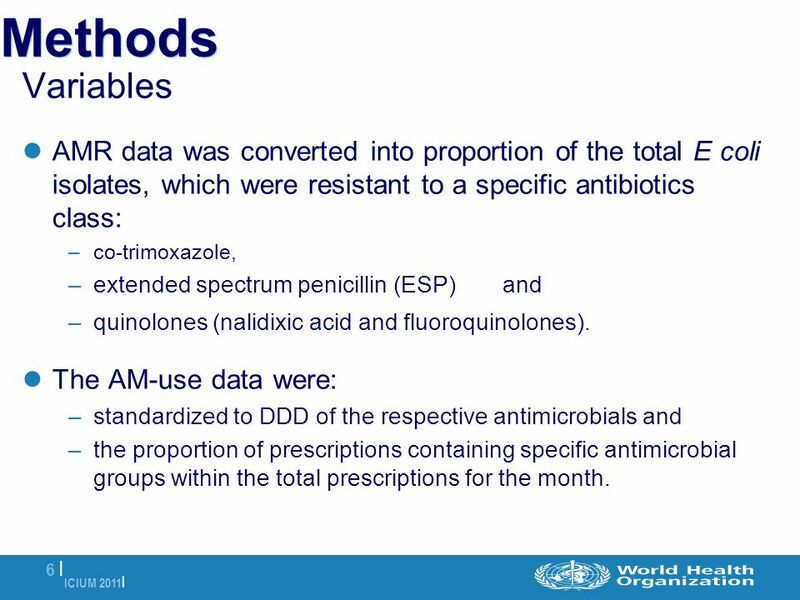 6 ICIUM 2011 | 6 |6 | Methods Variables AMR data was converted into proportion of the total E coli isolates, which were resistant to a specific antibiotics class: –co-trimoxazole, –extended spectrum penicillin (ESP) and –quinolones (nalidixic acid and fluoroquinolones). 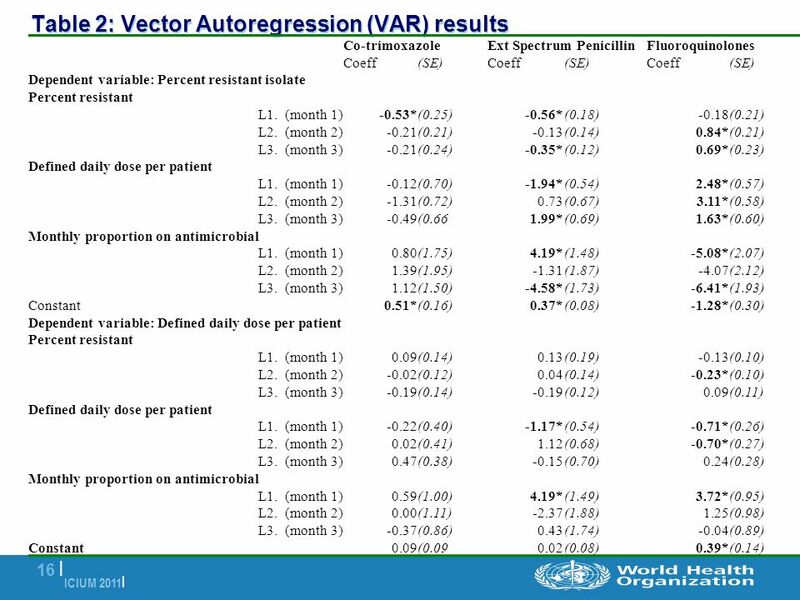 The AM-use data were: –standardized to DDD of the respective antimicrobials and –the proportion of prescriptions containing specific antimicrobial groups within the total prescriptions for the month. 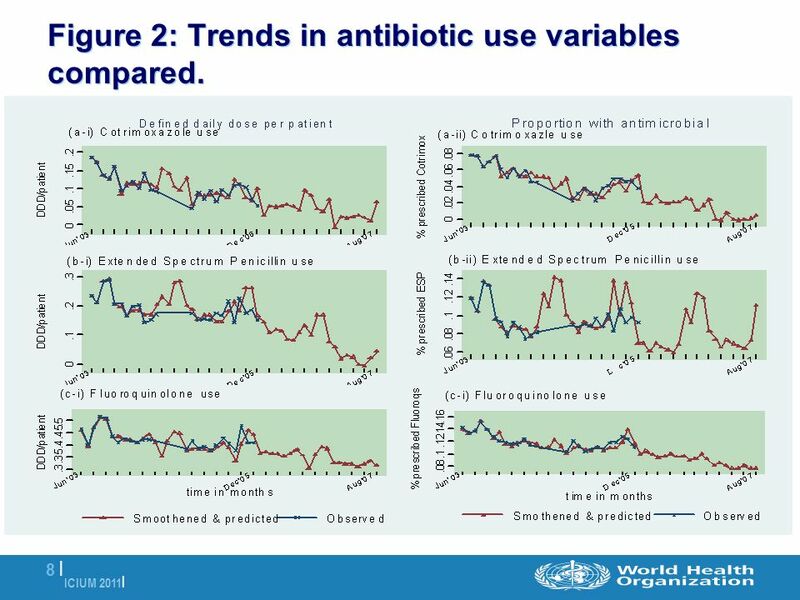 8 ICIUM 2011 | 8 |8 | Figure 2: Trends in antibiotic use variables compared. 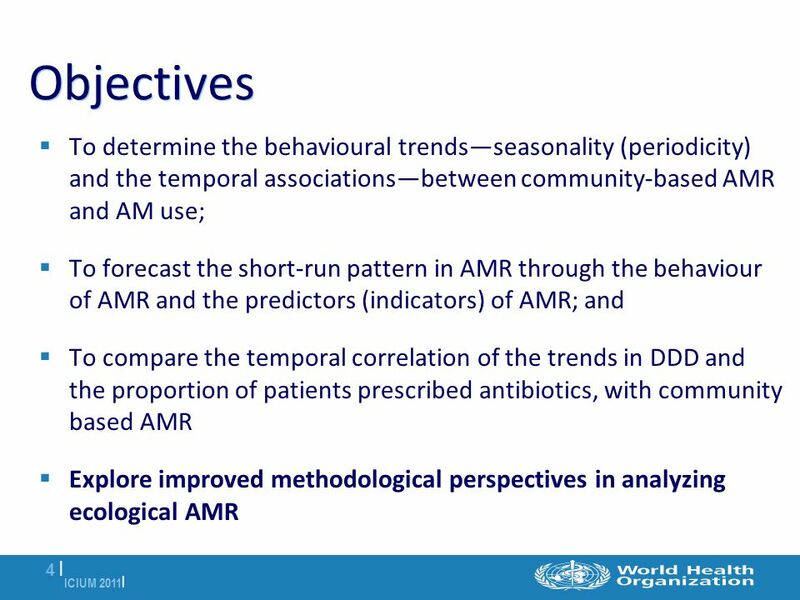 13 ICIUM 2011 | 13 | Summary Both AMR and AM-use demonstrated lagged trends and seasonality. 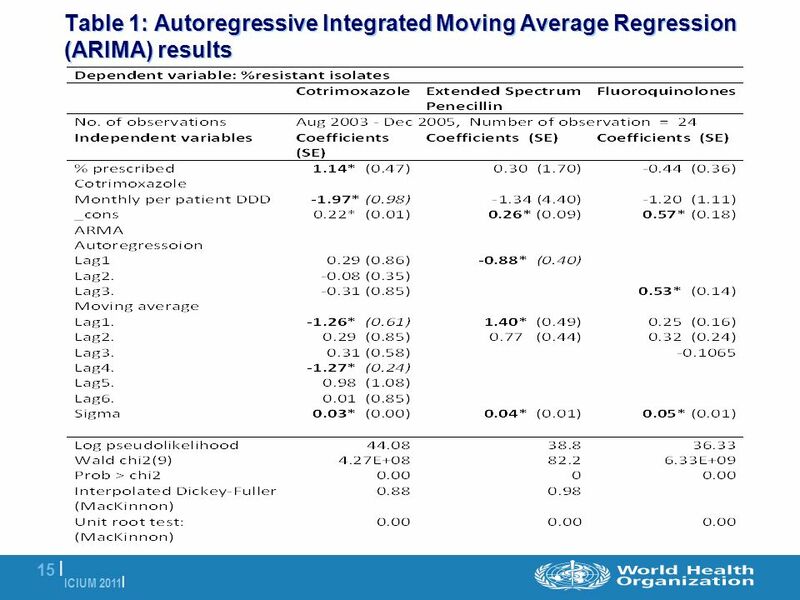 Parameter estimates from the VAR (table 2) are more efficient compared to those form ARIMA (table 1). 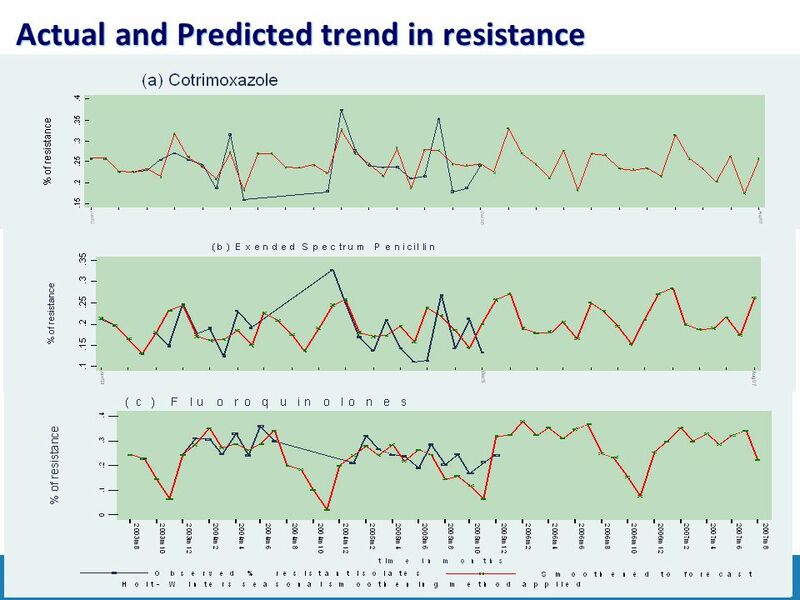 Seasonality spurs of resistance appear to synchronise with cold (catarrh) seasons when the antibiotics are freely and routinely used. 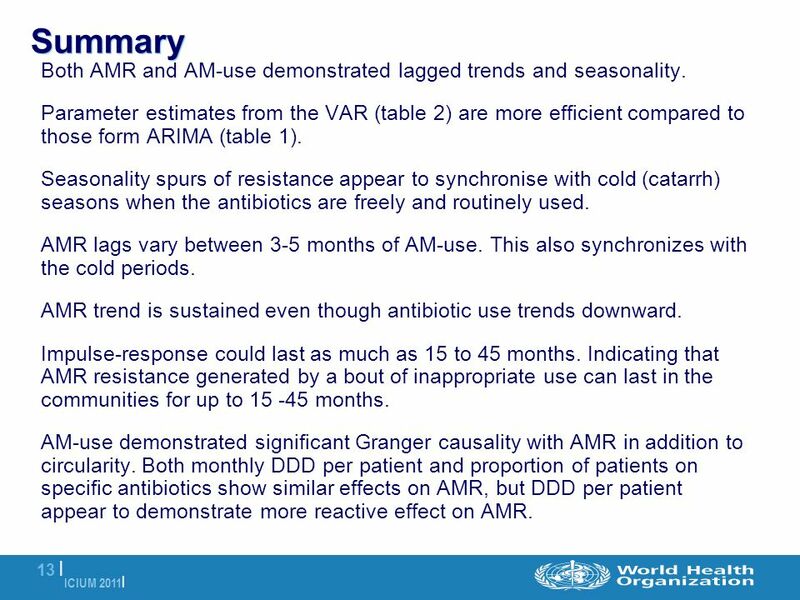 AMR lags vary between 3-5 months of AM-use. This also synchronizes with the cold periods. 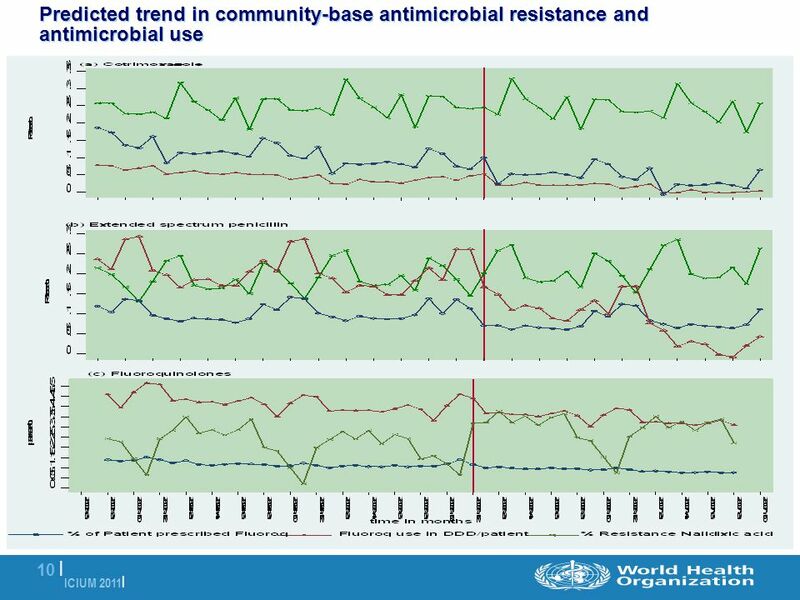 AMR trend is sustained even though antibiotic use trends downward. Impulse-response could last as much as 15 to 45 months. 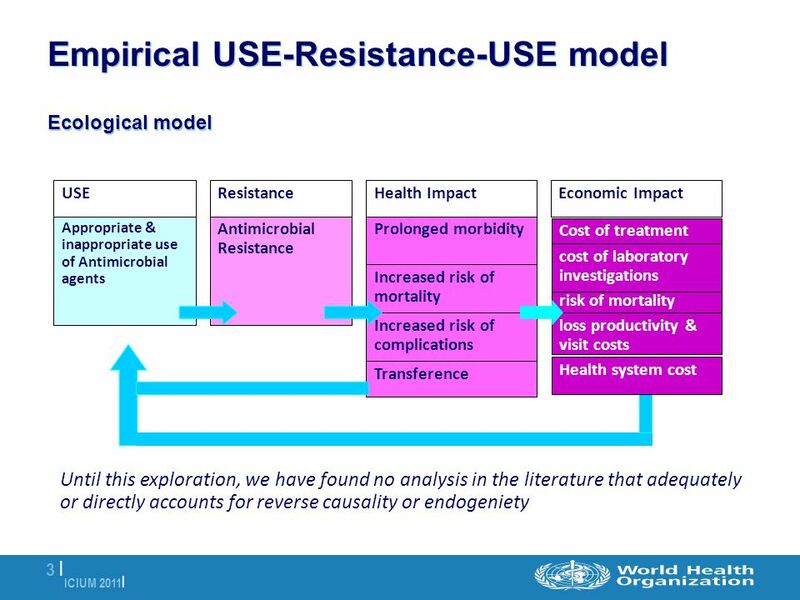 Indicating that AMR resistance generated by a bout of inappropriate use can last in the communities for up to 15 -45 months. 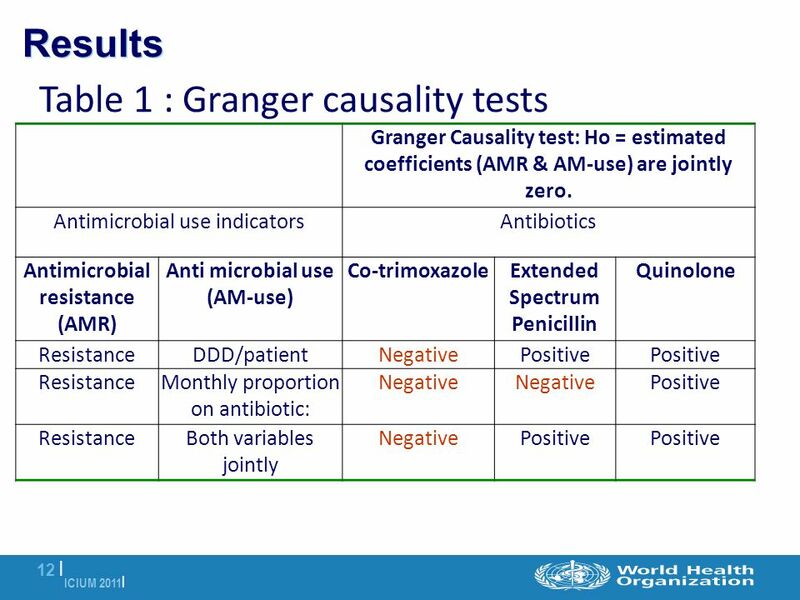 AM-use demonstrated significant Granger causality with AMR in addition to circularity. 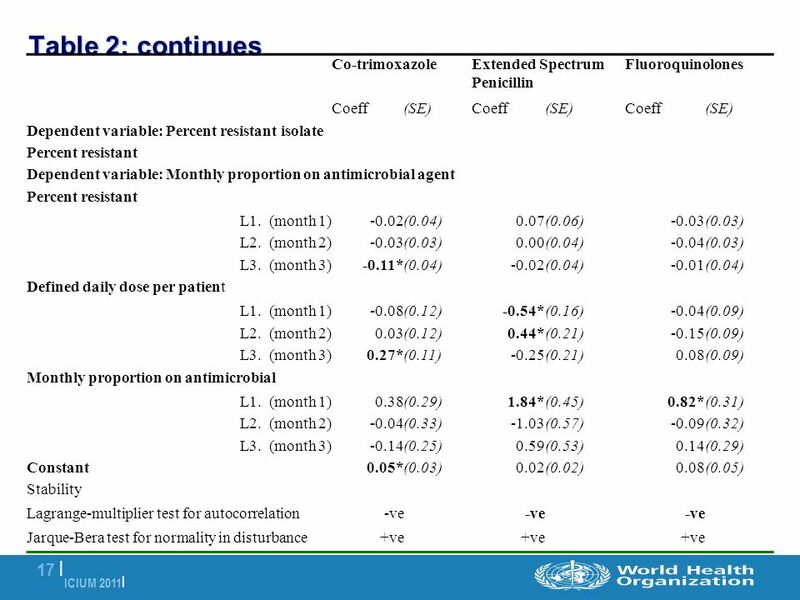 Both monthly DDD per patient and proportion of patients on specific antibiotics show similar effects on AMR, but DDD per patient appear to demonstrate more reactive effect on AMR. Download ppt "ICIUM 2011 | 1 |1 | Behavioural Model for Community-Based Antimicrobial Resistance, Vellore, India Dele Abegunde 1 ; Holloway, Kathleen 1 ; Mathai, Elizabeth." Saving Pregnancies and Newborn Babies From Syphilis Busisiwe Kunene Reproductive Health Research Unit (South Africa) January 2002. Forecasting Malaria Incidence in Botswana Using the DEMETER Data Simon Mason International Research Institute for Climate and Society The Earth Institute. REASONS FOR LONG-TERM LOSS TO FOLLOW UP OF ADULT ART PATIENTS IN SOUTH AFRICA: A PROSPECTIVE, QUALITATIVE STUDY METHODS RESULTS POLICY RECOMMENDATIONS. 1 Household Survey on Medicine Use in Oman Ahmed Abdo-Rabbo, Manal Al- Ansari, Brian Gunn, Batool Suleiman & Hawraa Al-Lawati Directorate of Rational Use. 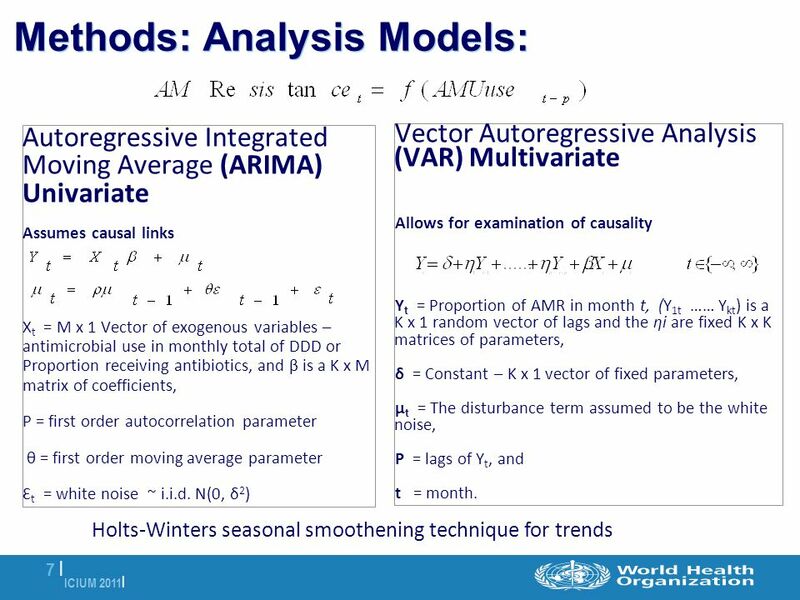 R. Werner Solar Terrestrial Influences Institute - BAS Time Series Analysis by means of inference statistical methods. Health service utilization by patients with common mental disorder identified by the Self Reporting Questionnaire in a primary care setting in Zomba, Malawi. Inaugural Conference of the African Health Economics and Policy Association (AfHEA) Accra - Ghana, 10th - 12th March 2009 Patent medicines vendors a resource. FACTORS HINDERING ATTITUDE TO TREATMENT AMONG PATIENTS WITH TYPE-2 DIABETES MELLITUS IN THE NIGER DELTA, NIGERIA by AGOFURE OTOVWE and OYEWOLE OYEDIRAN. SPATIAL DATA ANALYSIS Tony E. Smith University of Pennsylvania Point Pattern Analysis Spatial Regression Analysis Continuous Pattern Analysis. 1 BIS APPLICATION MANAGEMENT INFORMATION SYSTEM Advance forecasting Forecasting by identifying patterns in the past data Chapter outline: 1.Extrapolation. PHSSR IG CyberSeminar Introductory Remarks Bryan Dowd Division of Health Policy and Management School of Public Health University of Minnesota. 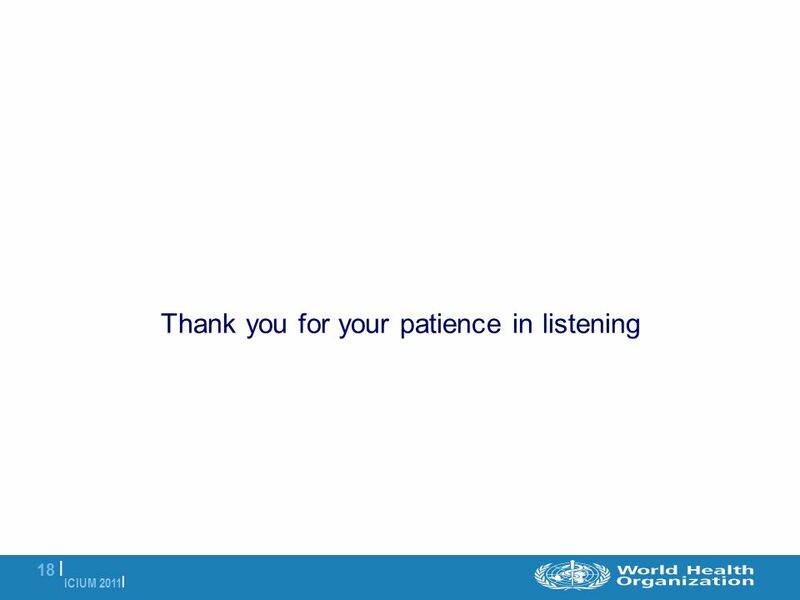 Problem Statement: In Kenya, despite the development of national standard treatment guidelines (STGs) for the management of acute respiratory infections.